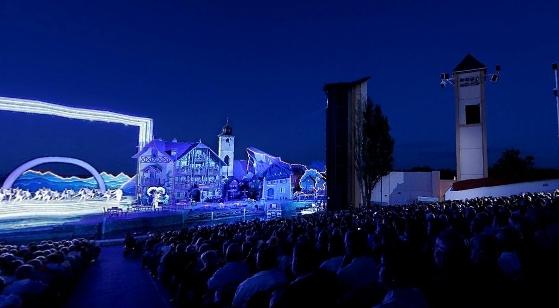 "Travel with us to faraway China" is the slogan of Mörbisch director Peter Edelmann in his second season at Lake Neusiedl. With "The Land of Smiles" by Franz Lehár Edelmann follows his plan to bring the "first guard" of operetta to the world's largest operetta stage. 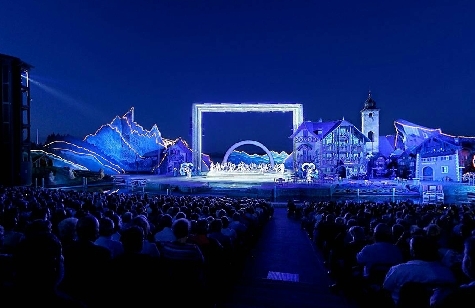 The density of unforgettable melodies such as "Dein ist mein ganzes Herz" or "Immer nur smächeln" and the world's largest operetta stage in the midst of the breathtaking natural scenery of Lake Neusiedl promise an evening that will be long remembered. Experience the touching love story between the Viennese girl Lisa and the Chinese Prince Sou-Chong, which is shaped by the influence of different cultures and social obligations. 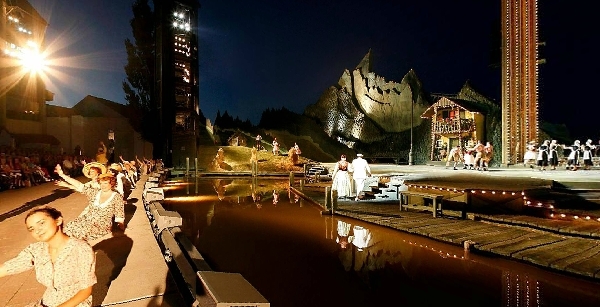 "The Land of Smiles is perhaps the most emotional of all operettas, which leaves no visitor unmoved", Peter Edelmann is certain, "an evening full of romance and great feelings is guaranteed". Be there when The Land of Smiles meets the Land of the Sun! 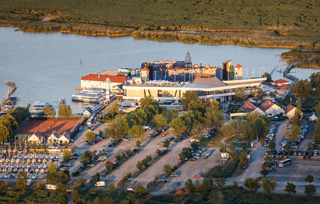 The lake stage is embedded within the “Neusiedlersee National Park”, at the edge of the Hungarian lowlands, where the landscape appears graceful and endless, and shows off its unique flora and fauna – truly a jewel of nature. 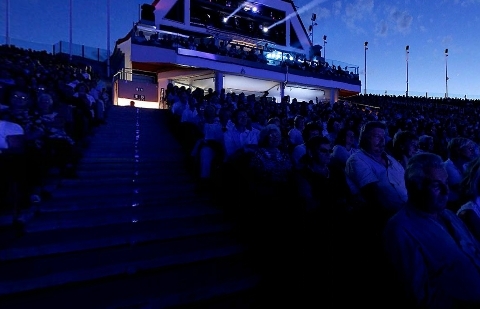 The stands have space for 6200 visitors, but no matter which row you select, all festival guests have an excellent view not only of the action on the stage but also of the Hungarian landscape. 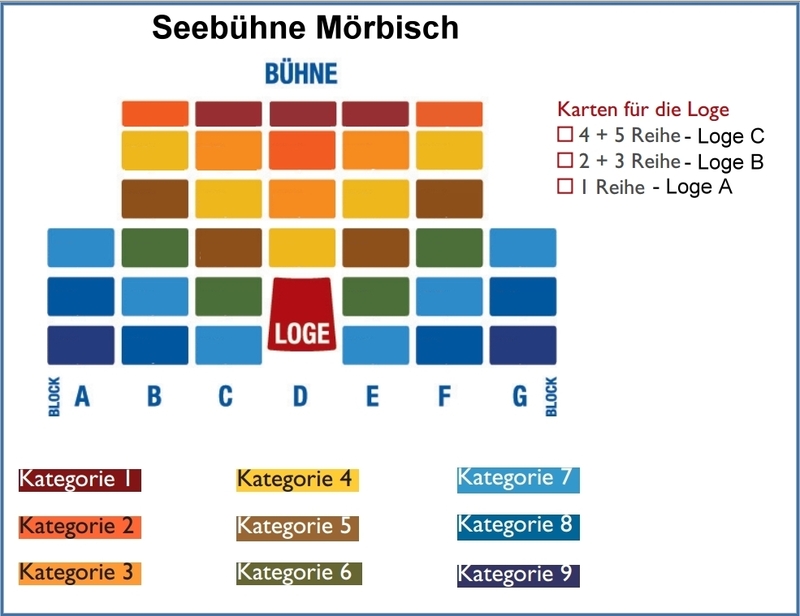 The stands are surrounded by speakers mounted at a height of 8 - 14 m, which use world-class sound technology to impart spatial information using a special simulation system: if the singer moves, his voice appears to move with him, making the auditory signal comparable with that in an enclosed room. Vienna via A2/A3 to Eisenstadt - Eisenstadt Ost exit- B50 direction Neusiedl am See - in Schützen am Gebirge turn right towards Oggau - Rust - Mörbisch. There is sufficient FREE parking DIRECTLY at the festival area.